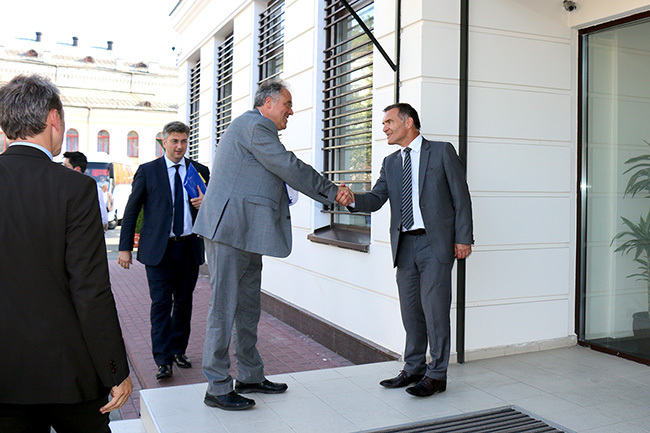 On 23 July, Acting Head of European Union Advisory Mission Ukraine, Hugues Fantou, met in Kyiv with the delegation from the Committee for Foreign Affairs and the Sub-Committee on Human Rights of the European Parliament (EP), headed by Andrej Plenkovic. The Head of Operations of the Mission, Peter Appleby, briefed the delegates on concrete actions and operations carried by the Mission in the civilian security sector reform and presented the mission’s assessment of the main challenges. The delegates were particularly interested in the issues of anti-corruption, possible gaps and coordination in the reform process in Ukraine. The EP delegation arrived in Ukraine yesterday and will stay for three-day intensive consultations on EU-Ukraine cooperation and the financial and expert assistance provided by the EU. They will meet with the relevant executive and parliamentary authorities of Ukraine — including the President, the Prime minister, the Speaker of the Parliament as well as representatives of civil society and political parties.